Of course, after watching Diners, Drive-ins, & Dives and Man Vs. Food all the time, I’d be insane not to try out Lombardi’s Pizza. 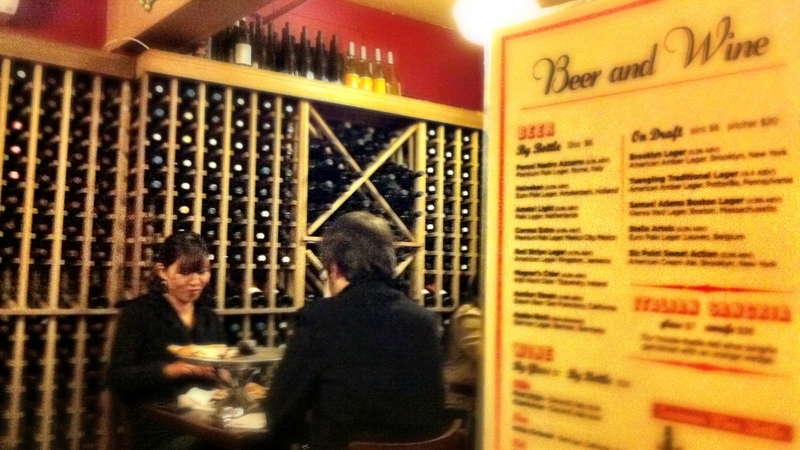 Zagat rated “Best Pizza on the Planet”, so who am I to say no to the World’s best;)? The menu is very simple; there’s nothing fancy, just a margherita pizza with a list of toppings. That’s how I liked it! Foodies are obviously not the most decisive bunch since we want to try it all! I actually wish I was more hungry, but during the 1-hr long wait I crossed the street and snacked at Rice to Riches (Darn, my lack of self control!). 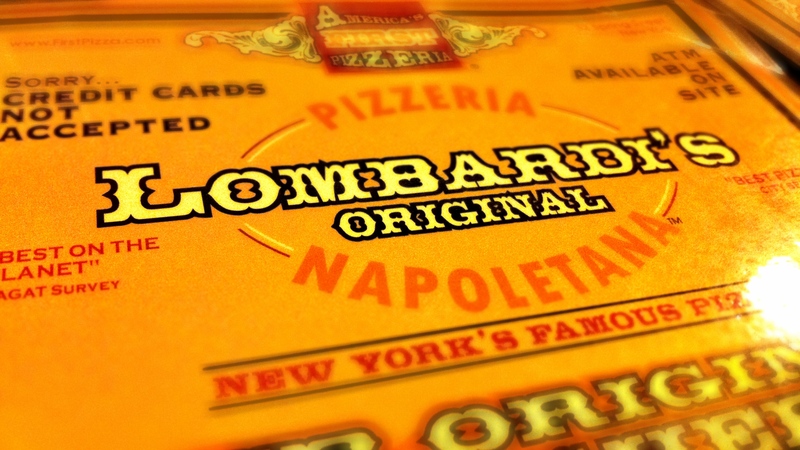 Although one slice is all I needed to experience Lombardi’s fine pizza (but of course, I had more than one slice;)). Ordered a 6-slice pizza with two different topping-duos. This half of the pizza was Pepperoni and Roasted Red Peppers:)! I loved the pepperoni, it had the perfect texture. Some pizzerias substitute “crisp” for dry (LOL), but Lombardi’s clearly serves fresh ingredients and the pepperoni was crisp and savory. While the red peppers had a bit of juiciness to it along with a hint of smokiness. But in my first slice I just appreciated the bare basics of the pizza. the pizza crust was so thin (to be realistic, like poster-board-thin), but sturdy enough to hold the large amounts of cheese and toppings. Oh dear! The cheese; the cheese was intensely stringy like it would stretch for miles but was so irresistible I’d just give up and shoved the whole piece of cheese in my mouth (excuse my table manners;)). 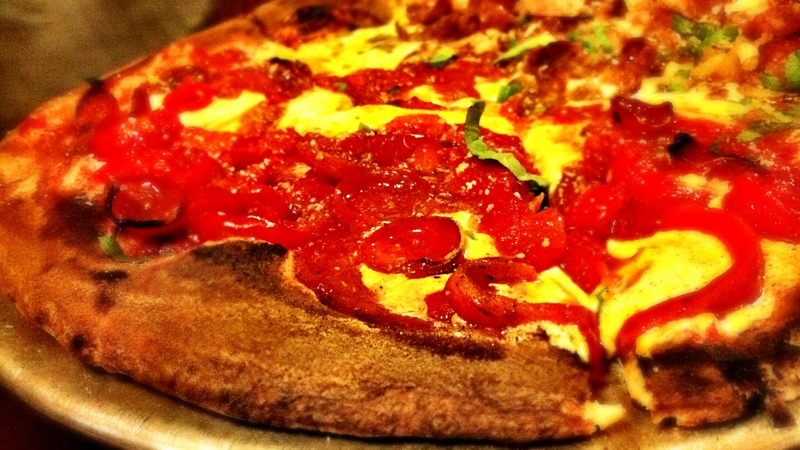 While the San Marzano sauce had a bold and rich tomato flavor, but brilliantly complimented by romano and fresh basil. I’d say that it would be a great pizza even if I’d just order a margherita. The second half was just as great as the first with some Sweet Italian Sausage and Mushrooms. I loved the big chunks of wild mushrooms, you can tell that they were fresh and not those colorless canned slices;). The sausage had a slight kick to it which I enjoyed because the mushrooms were fresh but lacked that extra flavor. 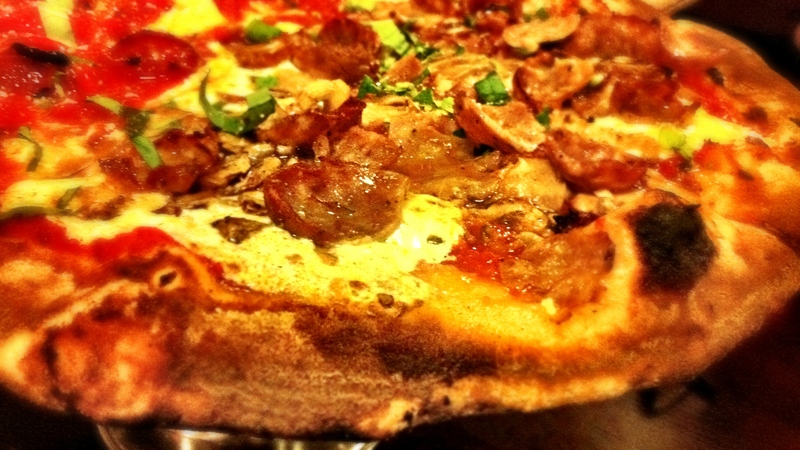 Overall, I loved the pizza and it’s really all about great ingredients and toppings that suit your tastes. So “No” I haven’t traveled around the world venturing to the deep corners of the globe to find great pizza. I can’t confirm that this is justly the “Best Pizza on the Planet”, but I’d be crazy to say they don’t make a quality slice of pie;). I’m definitely a New York Pizza-kind-a-girl (Thin crust FOR THE WIN! ), so this was my personal favorite pizza experience. If I was more hungry I could probably finish 6 slices on my own;).